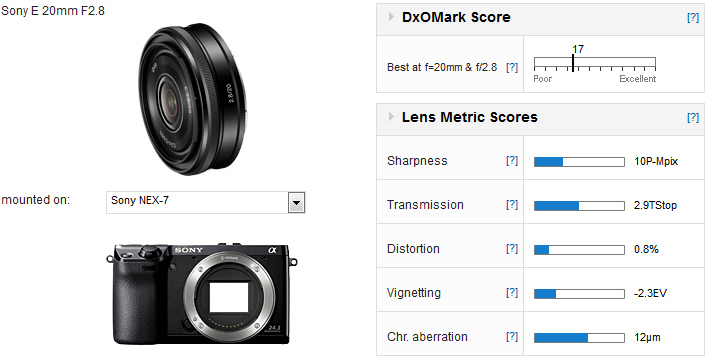 Attached to the 24-megapixel NEX-7 the Sony E 20mm f/2.8 scores an overall DxOMark Score of 17. A sharpness score of 10 P-Mpix is disappointingly low for lens tested on 24-megapixel sensor like the Sony NEX-7 and slight barrel distortion is noticeable. On the positive side the Sony E 20mm f/2.8 doesn’t suffer any noticeable chromatic aberration even in the corners with the aperture open at f/2.8. Costing $1300 for the Sony NEX-7 and E 20mm f/2.8 combined, this camera / lens combination is a similar proposition to the $1100 Nikon Coolpix A high-end compact, both offering an APS-C sensor in a small shell with a wide-angle ‘fast’ prime lens for street photography and photojournalism. 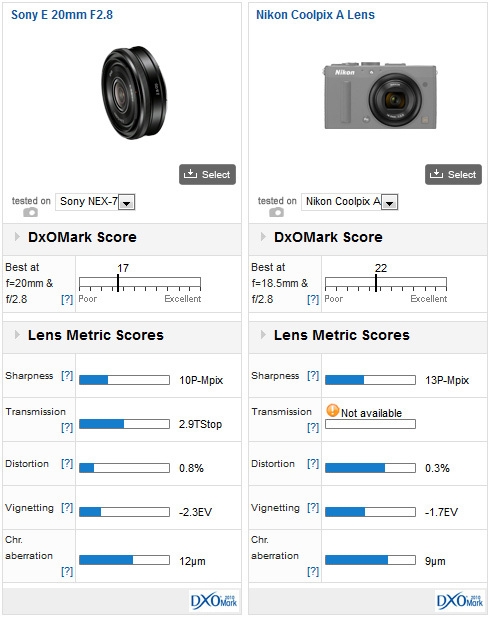 Achieving a DxOMark score of 22, compared to 17 for the Sony E 20mm f/2.8, Nikon’s Coolpix A lens offers better image quality. 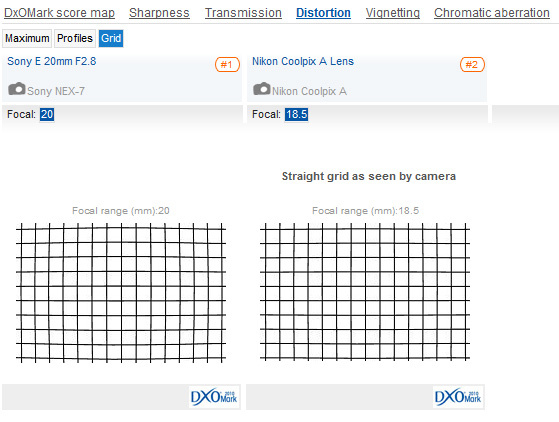 An improvement of 3 P-Mpix for Sharpness on the Nikon optic may not on the face it of seem that impressive, but taking account of camera resolution the Nikon lens achieves this score on a 16-megapixel sensor, compared to the NEX-7’s 24-megapixel variety, making the Coolpix A lens much more efficient. A closer look at the sharpness results also demonstrates that while the Coolpix A lens offers something approaching homogeneous sharpness at all aperture settings the Sony E 20mm drops off in the corners between f/2.8 – f/5.6. 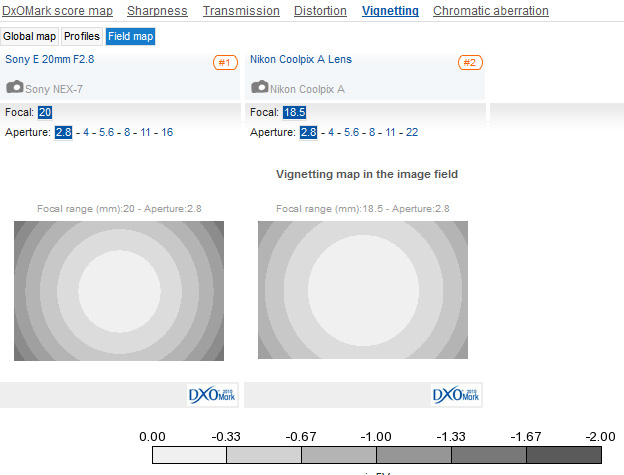 For vignetting, results are similar between f/4 to f/16, although the Coolpix A offers a +2/3rds Stop improvement at f/2.8, and whilst slight barrel distortion is evident on the Sony compared to the Coolpix A, neither lens suffers noticeable chromatic aberration. Taking all this into account the Coolpix A offers both better quality and better value, although with its interchangeable lens system the Sony NEX-7 is the more versatile option. 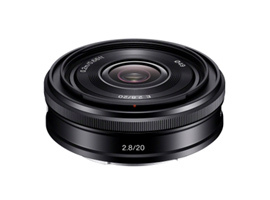 In summary the main advantages the Sony E 20mm f/2.8 lens has to offer are convenience thanks to its lightweight ‘pancake’ design, wide-angle field of view and ‘fast’ f/2.8 maximum aperture. 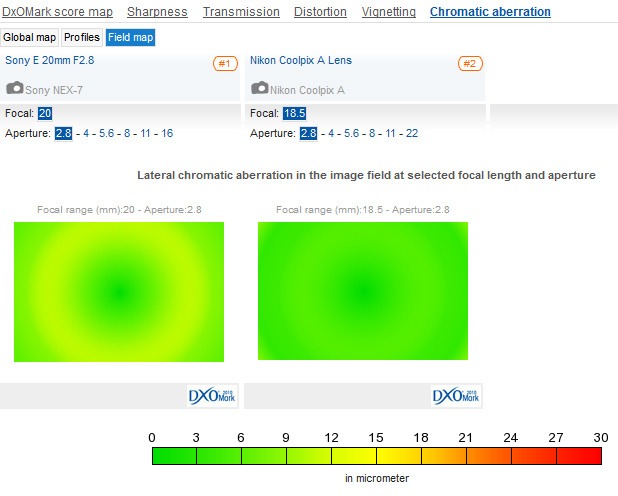 Optically it’s far from perfect and although Sony have minimised chromatic aberration, sharpness score of 10 P-Mpix is too low for a lens mounted on a 24-megapixel sensor. Some minor barrel distortion is also evident too and lens shading at the maximum f/2.8 aperture requires correction in post-production. If it’s a small and portable high quality camera you require for street photography or photojournalism the Nikon Coolpix A boasts better image quality and value for money, but doesn’t offer the flexibility of the Sony NEX interchangeable lens system.